Jade has yielded treasures of incredible value, such as a small, simple jadeite ring that sold for US$2.6 million, and a 27-bead emerald green jadeite necklace sold in Hong Kong for US$9.3 million. In 1999, a 2-inch diameter (0.33-inch thick) jadeite bangle sold at a Christie's auction for US$2.6 million, and a jadeite cabochon of 1.4 inches in length sold for US$1.74 million. So, how much is jade worth per pound? Good question! It is worth only whatever someone will pay for it. All jade in Wyoming is a variety known as nephrite (an amphibole) similar to much of the jade found in BC, Canada. 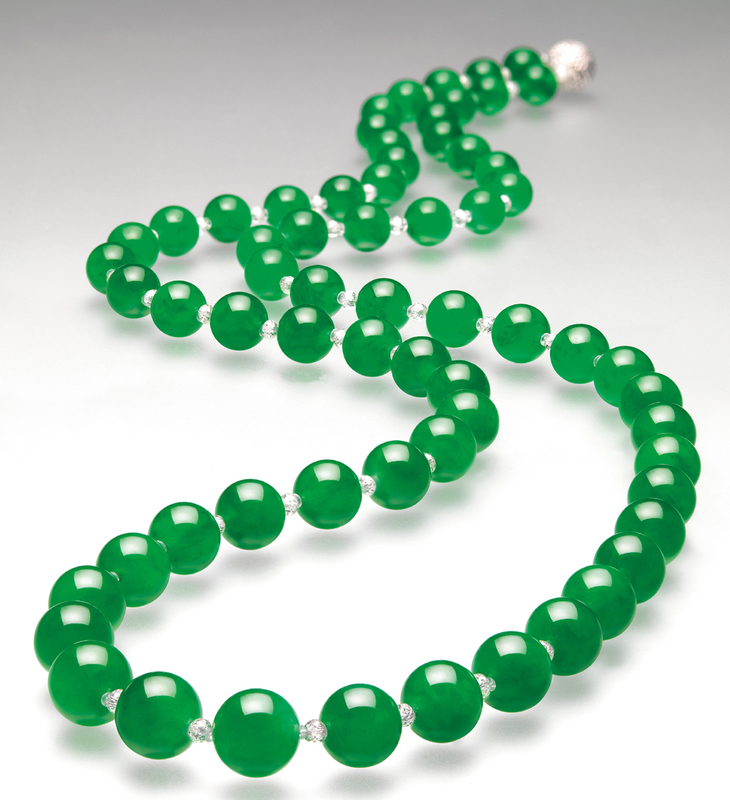 Much jade in the orient is jadeite (a pyroxene). But, these two are indistinguishable by the naked eye and require x-ray diffraction to determine which is which. Jade has a hardness of 6 to 6.5, but it is extremely tough and carvable. A knife only has a hardness of 5.5, so one must find tools with a greater hardness than a knife to carve this mineral, such as carborundum, corundum or diamond. The specific gravity of jade is about 2.8 to 3.2 and pieces of jade are often massive and exhibit a relatively high heft along with a distinct slick surface. In central Wyoming, jade found in Precambrian host rocks is often associated with a group of hydrothermal alteration minerals such as sericite, chlorite, epidote, zoiste and clinozoisite. When these are found together, one often can dig in the area of alteration and find jade - but digging in these hard rocks is very difficult at best. Some of the more valuable specimens of jade found in Wyoming were discovered in the 1950s in the central part of the state. However the source of this high-quality jade was never found according to my good friend, the late Dr. David Love. Essentially all of the high-quality gem-grade jade found in Wyoming occurred as detrital cobbles, boulders and pebbles in flats surrounding Jeffrey City and Crooks Gap in unconsolidated Tertiary boulder conglomerates and alluvium (and some rubies were also found in this area). The only jade found in place occurs in veins and replacement deposits north of Jeffrey City in the old, Archean (>2.5 billion years old), basement rock. However, this jade is lower quality. So, somewhere in this region, there is a hidden source for some of the best jade ever found. Nephrite jade never shows external structure, except when it (rarely) pseudomorphs a crystal habit of another mineral. In the Granite Mountains of central Wyoming near Jeffrey City, some nephrite is found pseudomorphing quartz. Such specimens form pseudohexagonal (six-sided prisms) of light-green jade. In other places, jade is found enclosing quartz. Typically, nephrite jade occurs in irregular masses that lack cleavage. Microscopically, nephrite exhibits a mass of matted, intricately interwoven fibers. This form makes nephrite extremely tough and resistant to fracturing. Unless the rock has a schistose (foliated) fabric, rounded boulders of nephrite are impossible to break with a hammer. Nephrite (jade) consists of submicro­scopic, intricately interwoven, actinolite-tremolite mineral fibers that produce a massive and extremely tough gemstone. Nephrite is a result of the alteration of pyroxene in metamorphic terrains. The nephrite form of actinolite-tremolite is one of the toughest minerals known - and it is not magnetic! Nephrite can be confused with a number of minerals and special care must be taken for accurate field identification. Positive identification almost always requires testing by x-ray diffraction (XRD). The following rules of thumb are used for field identification of jade: (1) Nephrite is heavier than the average rock of the same size. (2) Nephrite cannot be scratched with an ordinary knife blade (if it scratches, it is likely serpentine or chlorite, or another similar appearing mineral). (3) Nephrite has smooth, almost waxy appearance. (4) If the end is ground off of a suspected jade speci­men, the fresh surface will not sparkle or glitter in the sun. If it sparkles, it's not jade. (5) Nephrite is not magnetic (if it is magnetic, it is probably serpentine). (6) Nephrite is associated with a distinct alteration mineral assemblage of pink zoisite, white sericite, pistachio-green epidote, and dark-green chlorite. Rocks often mistaken for nephrite include fine-grained quartzite, serpentinite and epidotite. These occur in the same geologic environment as nephrite. More information on the characteristics of jade and where it can still be found in Wyoming is published in a book on gemstones (Hausel, 2014). Serpentinite can be a problem for many jade prospectors as well as first time buyers of jade who are scammed by sellers. Serpentinite is found in the jade fields of Wyoming and in British Columbia and many prospectors mistaken the rock for jade. I have seen rock collectors in the Riverton, Wyoming area sell serpentinite as high-quality jade to unsuspecting buyers - even after I pointed out to the unscrupulous individuals that the material was serpentinite. Even though serpentinite will typically have a nice green color similar to jade, it is softer and can be scratched with a pocketknife. According to Hausel (2014, 2009, 2005) and Hausel and Sutherland (2000), serpentine, which is found in the Tin Cup district of the Granite Mountains, only has a hardness of 2.5 to 5.5 and has scattered pockets and disseminations of magnetite, making the rock weakly magnetic. Jade does not contain magnetite and is non-magnetic. In the past, one deposit known as the Game Warden's jade found in the southern Wind River Mountains which caused quite a stir after it was discovered and reported to contain giant jade boulders - was probably all serpentinite. When examined by Hausel several years ago, only serpentinized ultramafic komatiite, similar to those found at South Pass, could be found. Quartzite can be distinguished by its granular texture since it tends to sparkle on a freshly broken surface. Epido­tite is softer, like serpentine, and can also be scratched with a knife. Nearly all serpentinite will have magnetite and exhibit small areas, lenses, or specs of magnetism. In Wyoming, nephrite occurs primarily in the Granite Mountains and has also been reported at scattered localities from the Wind River Mountains to the northern Laramie Range in a narrow east-west band that encloses the Granite Mountains north of Jeffrey City. However, we were not able to verify any occurrences in the Wind River Mountains. Individual Wyoming jade localities are described by Hausel (2014). Many are found within the Tin Cup district northwest of Jeffrey City (T30N, R92-93W), and marked by old prospect pits in the granite and gneiss. Jade was at one time highly sought after by prospectors in the US. Much of the very high-quality emerald green and translucent jade was found in Tertiary conglomerates at Crooks Gap in Wyomng. Lower quality light-green jade was found in place to the north of Crooks Gap in the Granite Mouintains. In the 1930s and 1940s, many jade boulders of several hundred pounds were found near Jeffry City, central Wyoming. Hausel, W.D., 1986, Minerals & Rocks of Wyoming. Geological Survey of Wyoming Bulletin 66, 117 p.
Hausel, W.D., 2014, A Guide to Finding Gemstones, Gold, Minerals & Rocks: GemHunter Books, 369 p.
Hausel, W.D., Various Gemhunter Newsletters.